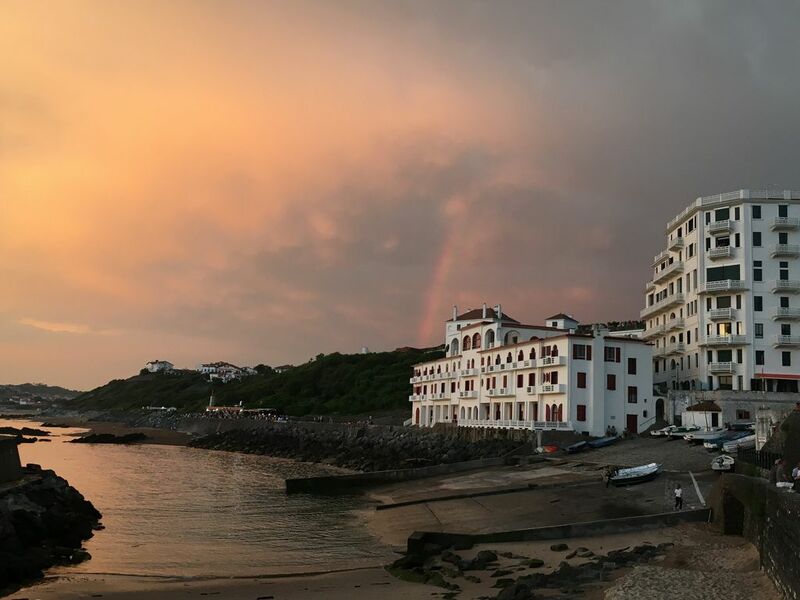 Situated in the picturesque and charming village of Guethary, the flat has a unique position on the seafront, directly overlooking the sea (there is nothing between us and the sea, it is like being on a cruise liner!). It is ideal for families as there 3 beaches just a stroll away with no road to cross. Although protected from mass tourism, Guethary is a lively village offering a wide variety of activities, restaurants and amenities and an unrivalled basque charm. Bathroom with shower, basin and WC. Separate WC. Bath towels available. Just bring beach towels. Living/dining room with a balcony overlooking the sea. Large traditionnal basque table. Sofa and armchairs. TV, DVD player. Wifi. Separate fitted kitchen complete with oven, induction hob, fridge/freezer, dishwasher and microwave. Also kettle, toaster and coffee machine. The dining area is within the lounge, allowing views and sounds of the sea. Access to the flat is done via stairs, and the surrounding area is not very practical for wheelchairs. Notes on accommodation: The flat is a spacious 80sqm (845sqft) on the 2nd floor but only one flight of stairs. There is no direct vehicular access to the building but there are 2 free car parks within 100m. If you have any specific requirements (cot, highchair amongst others), please do not hesitate to ask and we'll try our best to help. Outside: The outside space is the balcony. It overlooks the beach (our garden!) and the sea (our swimming pool!). Cleaning / Towels / Linen / Maid service: The flat is cleaned between rentals. Extra cleaning during rental possible on request (at extra cost). Linen as well as towels are provided but not beach towels. Other: Large entrance hall with storage facilities. Perfect location for surf, restaurants, walking everywhere, view! My 18 year old son and I had an amazing surf vacation. The location is directly above the Parlamentia surf break and easy walking to Alcyon, Avalanche and Cenitz. It is beautiful and ideal and very close to the train and buses. The apartment is in a beautiful historic Basque building with plenty of charm. It is decorated very plainly but efficiently with direct ocean views from the master bedroom and loving room. The kitchen is simple but modern with enough pots and pans and all for us to cook almost every day. Emma was easily accessible and answered questions very quickly. Many thanks for staying with us. It is a real pleasure to have poeple who appreciate Guethary. (For those of you worrying about what a "loving room" is, I think it was supposed to be "living room"!). Fantantic views, great cafes and restaurants nearby. We had a fab time. We had a most enjoyable week at this property. We walked the coastal path twice to St Jean de Luz. The apartment itself is right on the water making it feel like being on a cruise ship. The apartment is an authentic French apartment, and is well stocked with all the necessities. The owners are very helpful, while booking we asked for a hair dryer, as there wasn't one mentioned in the description, but when we arrived at the apt there it was in the bathroom, much appreciated. Guethary the village worked well for us, as we had given up our car rental, the village has a small grocery store and several bars and restaurants, the bus and train service were sufficient for travels further afield. But the view and the sound of the ocean is the big appeal. The only draw back was the third bedroom (with one single bed) did not have a window to the outdoors, it seemed better suited for a child than an adult due to the limited space. Also the dishwasher and washing machine, could use a little attention. Many thanks for the feedback, and we are very pleased you had a great time. We do our best to help guests have a pleasant stay, and above all profit from the location. The third bedroom is indeed small, but there is built-in wardrobe space just opposite the door. The washing machine has for a while been on our list of things to do to improve the facilities, and I have now got a new machine which will be installed over the winter. Following your remarks, I will also have a look at the dishwasher which we have not previously identified as an issue. We had a lovely stay in this charming family flat. The location cannot be beaten. The flat is very well equipped and the character of the family is all over it, making it feel as if you have come to someone's treasured multi-generational home, which is what it is. Thank you, Emma (and family) for our stay in your charming flat, and also to Matthieu for meeting us on a Sunday at lunchtime. The flat is very French and full of charm and the location is perfect with a beautiful view of the sea. It is very convenient for the railway station, and very close to the centre of the village for access to bars and restaurants. We enjoyed our stay very much and would recommend it. Merci beaucoup. L'atlantique est notre piscine privé! There are 3 beaches within a few hundred metres from the flat, the nearest ones are next to the building and accessible without crossing any roads. Several other beaches are within easy walking distance. The main beach has life guards in the summer. The beaches are sandy with some stones. They are very child friendly and offer great rock pool fishing at low tide. Guethary is also renown for its surfing spots, one of them is right in front of the balcony! The coastal footpath runs next to the building. Biarritz is the closest airport 10km and is served by Ryanair and EasyJet from various UK airports. Pau, Bordeaux and Bilbao airports are within 2 hours drive on the motorway. The nearest A63 motorway junctions are 5km away (either north or south). Access by train is also possible (main line is Paris to Spain by TGV, in the summer some trains do stop in Guethary otherwise change in Bayonne or Biarritz). Car not essential but recommended to explore the area. Parking in Guethary is free. Biarritz is 9km away, Saint Jean de Luz 6km. Spain is only 20km south. Guethary is situated on the coastal path and you can walk to Biarritz or Saint Jean de Luz. Guethary is a typical basque fishing village (the quaint and picturesque harbour is right by the flat). Although away from mass tourism, it has several shops (including clothes shops, small supermarket, bakery, pizza takeaways, pharmacy ...). But bigger supermarkets are only a 5 minute drive away. There are several good restaurants right on the seafront or in the village to choose from for a meal out. Traditional basque events are organised during the summer. Also in the village you can find an art museum, tennis courts, surf schools. Several golf courses are within a 30 min drive. Changeover Day: Normally Sunday in the summer months. Some flexibility possible, please check.